Sandstone gives the Red Fort, Agra its colloquial name but the real colour of this historic complex comes from the people who visit. 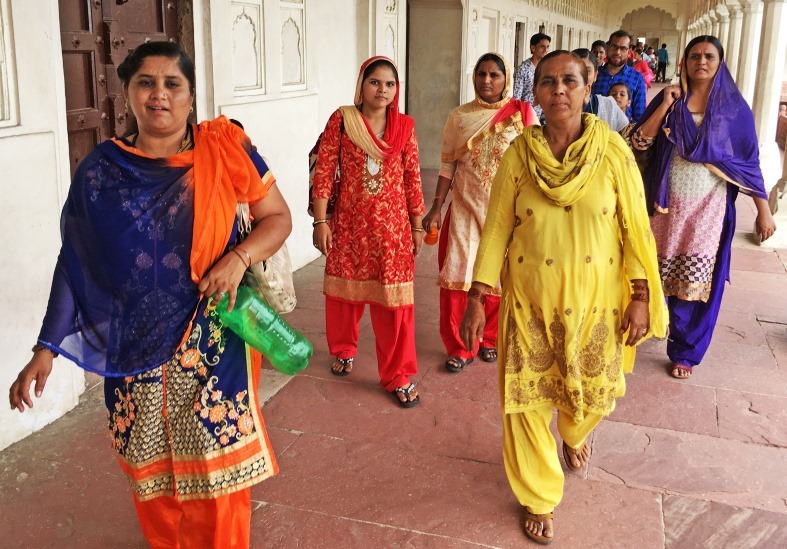 Indians dress up in their best clothes for an outing to one of the finest Mughal forts in India. The fort was the site of a battle during the Indian rebellion of 1857, which caused the end of the British East India Company‘s rule in India, and led to a century of direct rule of India by Britain. 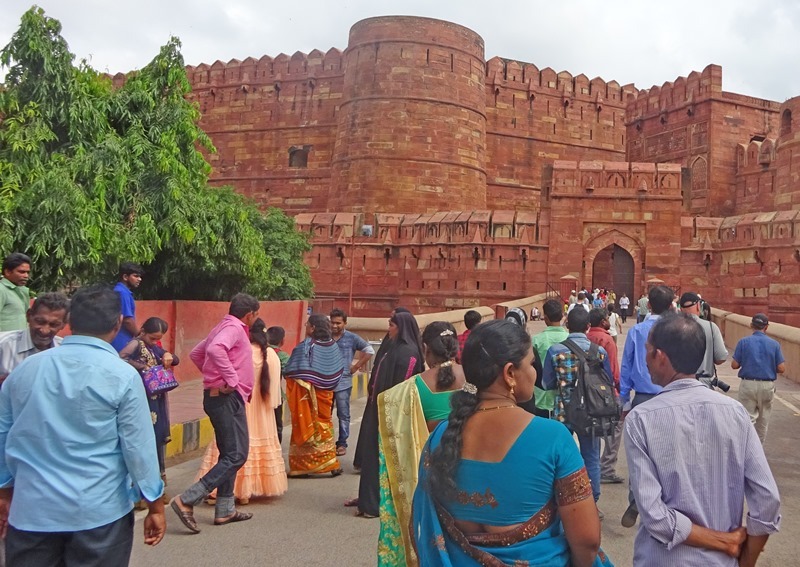 On the day I visited the Red Fort foreign tourists were outnumbered 10/1 by the beautifully bedecked locals who throng this walled city. here are some of the photos I took of these friendly people. 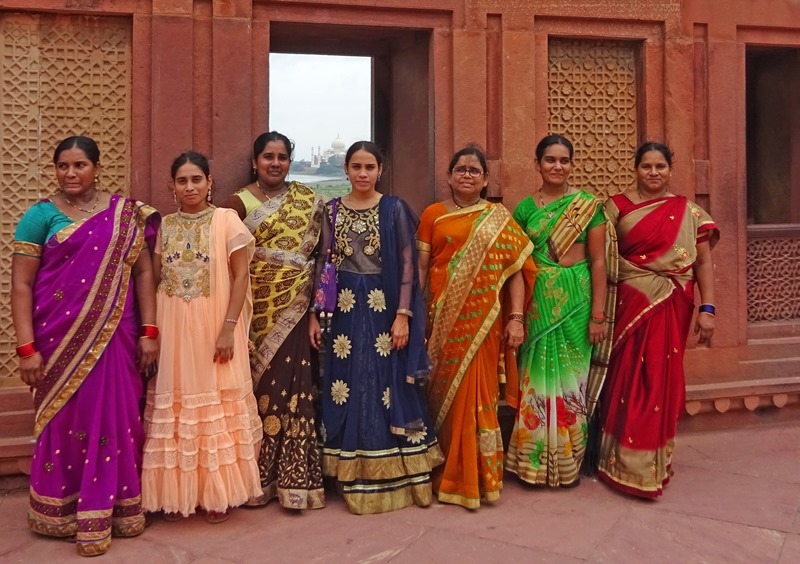 Cerise, salmon pink, gold and aubergine, orange, lime green, taupe and maroon; gorgeous saris worn by these lovely women who kindly posed ofr a photo beside a window overlooking the Taj Mahal. 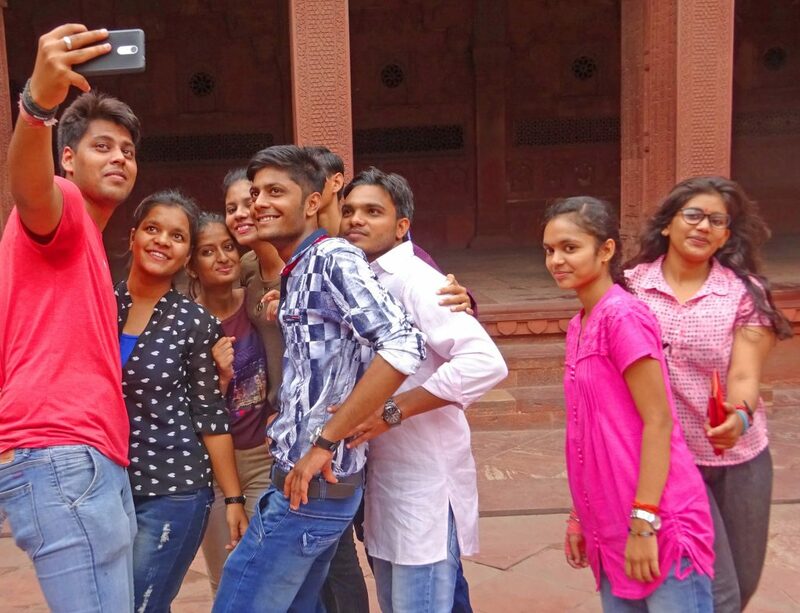 These youngsters were clearly having fun posing for selfies at every opportunity around the site. I kept seeing them and in the end, they invited me to join their photo shoot! 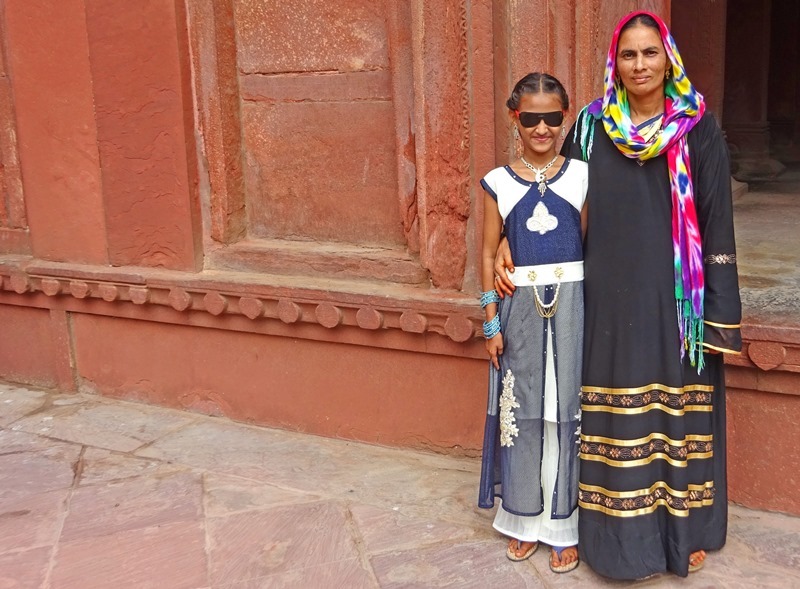 I love the simplicity of this pose; the rather shy mother wearing a simple robe and pretty scarf, her daughter looking so cool in her sunglasses. 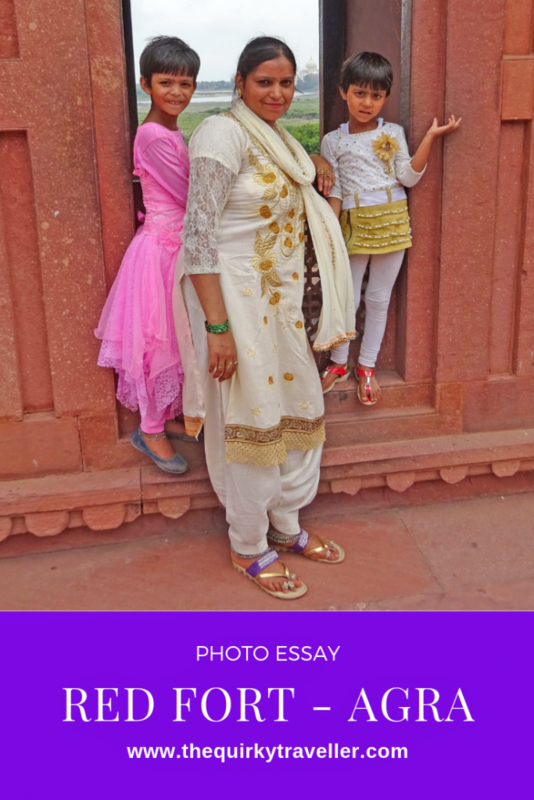 Everywhere you look at the Red Fort, Agra, there are families and friends chatting, laughing, eating, taking photos and generally having a great time on their grand day out. Before this photo was taken, the proud father showed me his baby whilst his oldest daughter translated and his wife and mother listened quietly in the background with the other two children. 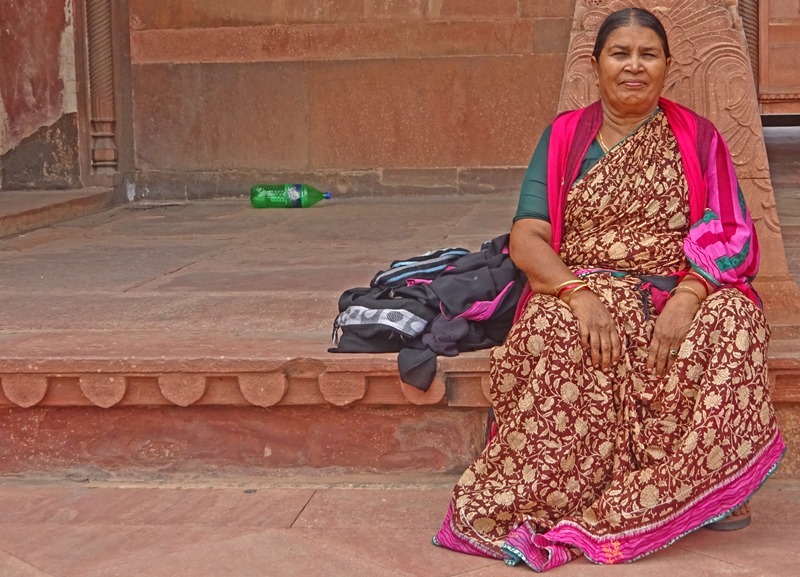 They had come from the country for the day out and had never visited Agra before. This lovely lady sat patiently while lots of tourists took her photo. 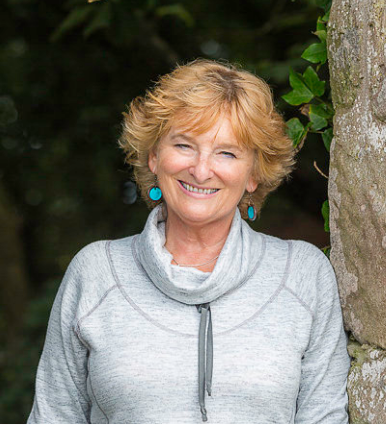 She held the same expression of resigned friendliness throughout, but as soon as we’d finished, she got up and trotted over to her friends, shrieking with laughter. 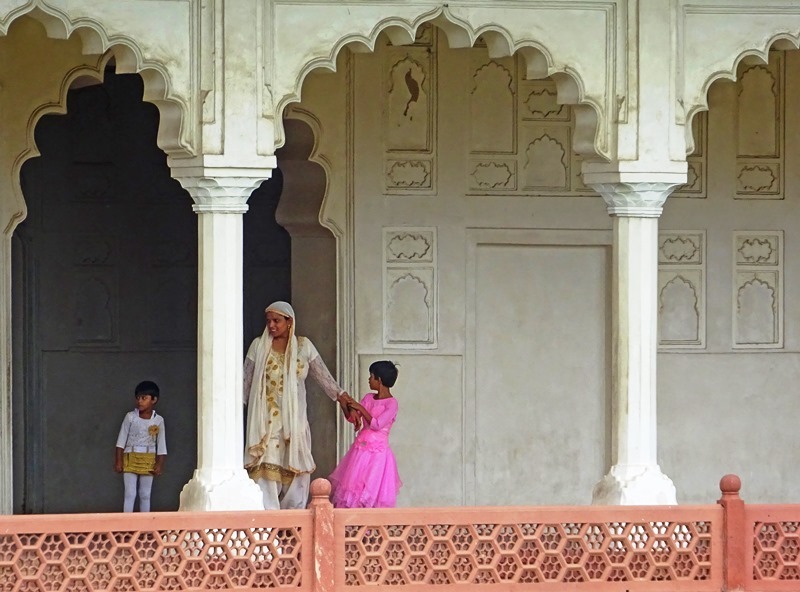 Throughtout my time exploring the Red Fort, this family kept appearing. The mother and son look so elegant in their white and gold outfits but it is the little girl’s candy floss pink dress that really draws the eye. In this photo, a little boy tenderly touches his baby brother whilst his mother and grandmother watch. I showed them the photo afterwards and the mother had tears in her eyes as she looked at it. 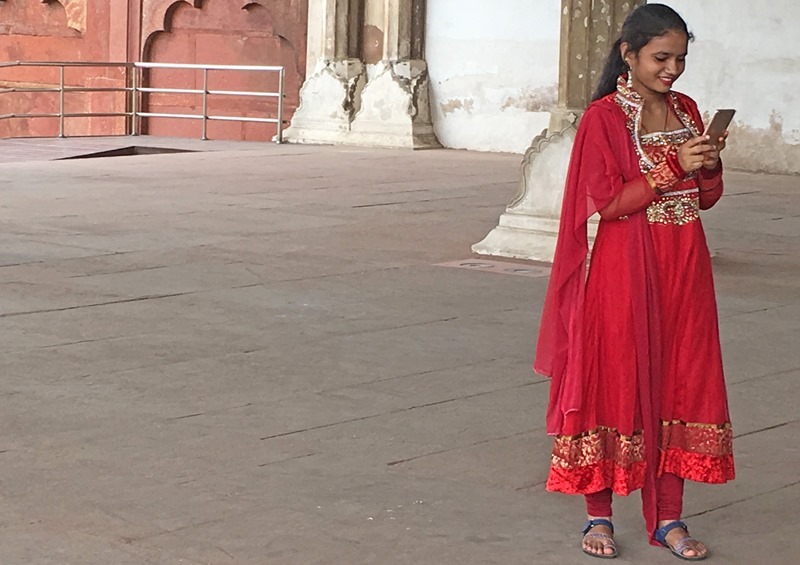 Modern and traditional life in perfect harmony … Just like any other teenager around the world, Indian youngsters love their smart phones. This beautiful lady in red was absolutely engrossed in reading her messages; I was very taken by her gorgeous sari. 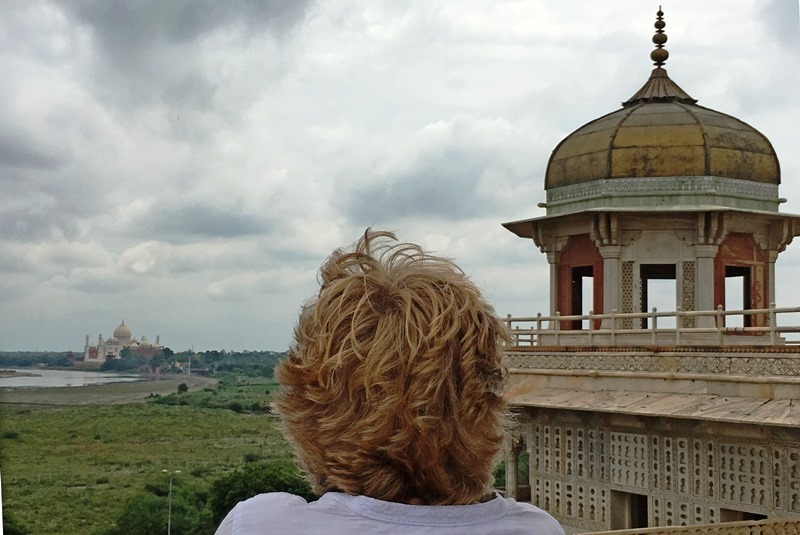 This is one of my absolute favourite photos from the India trip. 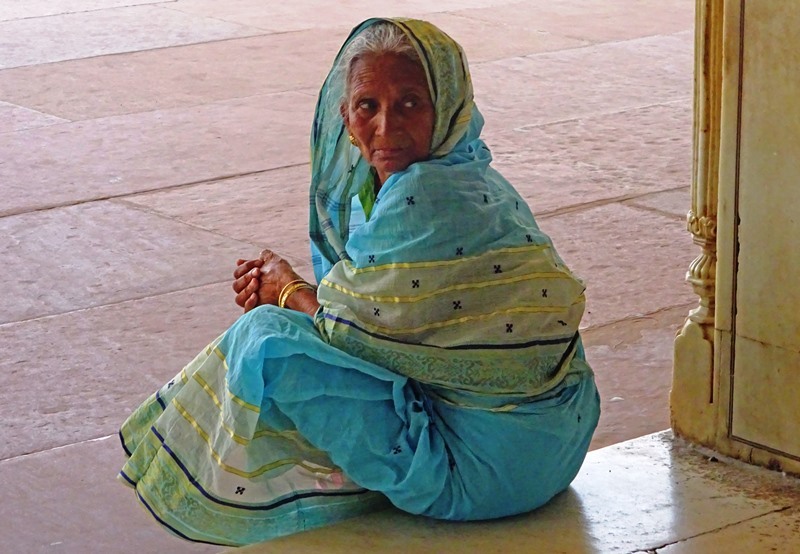 This elderly woman was sitting quietly under an arch in an immaculate blue, green, white and gold cotton sari and wrap. She epitomises the eternal elegance, strength and grace of the women of this fascinating country. 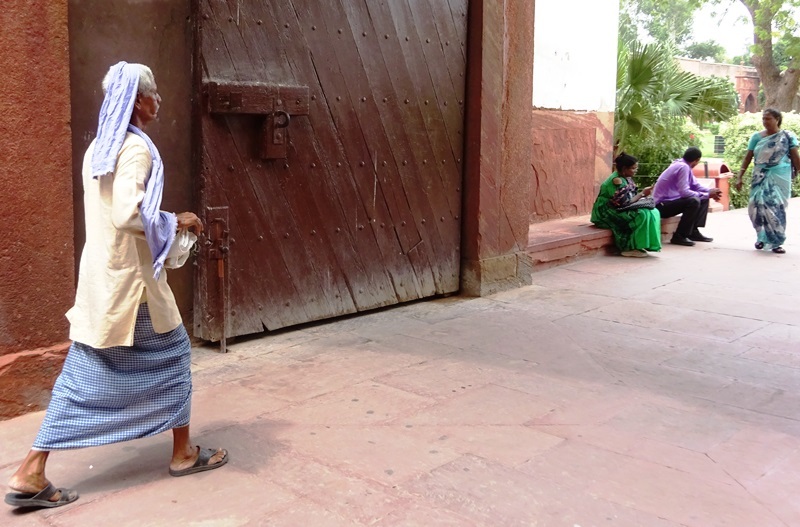 Striding purposefully out of the Red Fort, this gentleman rocks the blue and white look to perfection. I have no idea if he set out to colour-coordinate his clothes that morning but the effect was clasically fab! I bought this book to do my research before visiting Agra; it has a good section on the Red Fort and an even better one on the Taj Mahal. 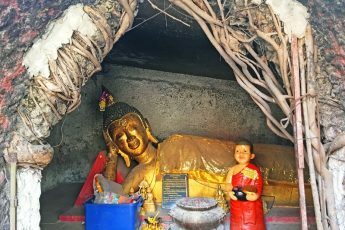 I travelled to India courtesy of Great Rail Journeys, finally fulfilling a life-long dream to visit this mind-blowing country. All views and photos are my own. 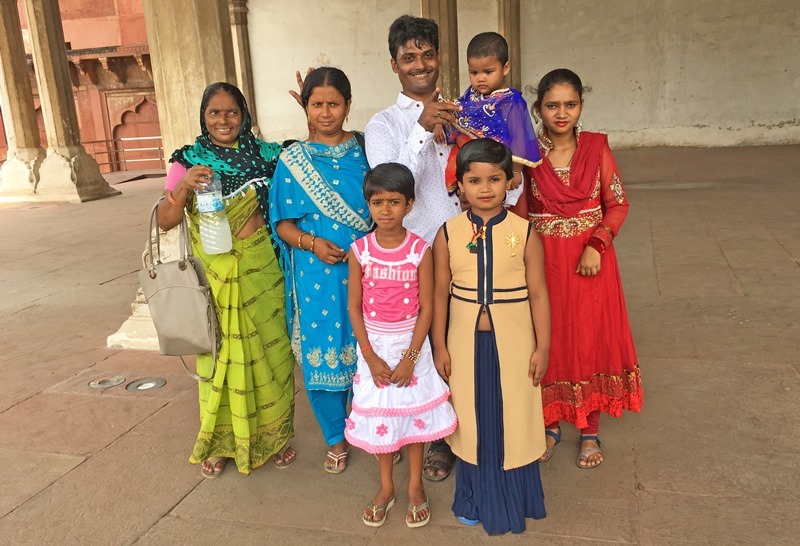 If you’d like to go on a similar trip, take a look at Great Rail Journeys escorted tours of India and start planning your trip of a lifetime now 🙂 Thanks to our wonderful guide Farouk of Sita India and to the very friendly staff of the 5* ITC Mughal Hotel in Agra. 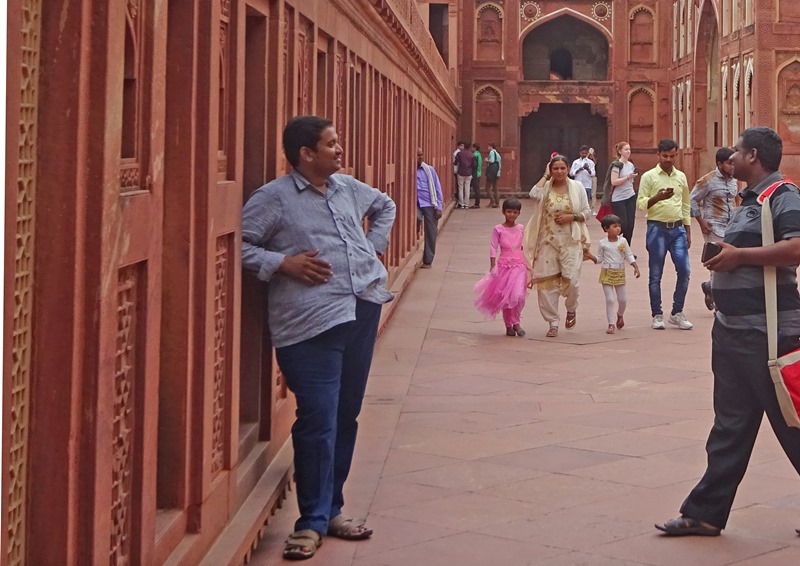 I loved doing this post because it brought back such happy memories of our visit to Agra, surely one of the most fascinating cities in the world. 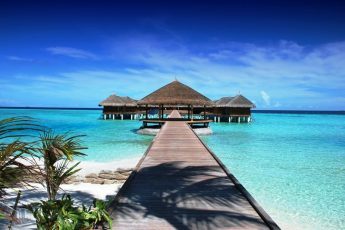 And for a VERY popular tourist destination, still friendly and welcoming.